Laser Tools Racing’s Aiden Moffat sealed maiden weekend Dunlop #ForeverForward honours of 2017 at Silverstone, making up the second-highest number of positions over a meeting this year with a massive 30 places gained. The young Scot was on a real charge as he strived to make up ground from his starting berth of 24th after Saturday’s qualifying session. He steered his Mercedes-Benz A-Class to a stunning eighth and just seven seconds shy of race winner Tom Ingram come the chequered flag. A broken driveshaft put paid to his race two, enforcing a start from the back of the grid for race three. His recovery drive took him as far as the points and 14th spot. That #ForeverForward haul was enough to see him into the competition’s overall top three. Adrian Flux Subaru Racing man Ash Sutton was forced into a similar fightback in the finale after a third strike penalty saw him demoted to the back of the grid. 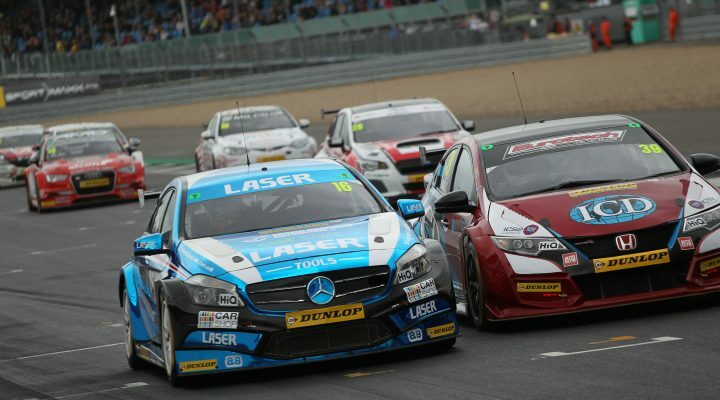 The Drivers’ standings leader picked his way through incidents and a safety car period to finish 11th – notching crucial points for his championship charge while immediate rival Colin Turkington suffered a tumultuous race on the way to a 22nd-place finish. On his return to the BTCC – his first appearance since 2004 – Rob Huff progressed from 28th in qualifying to the podium come race three. This saw the Power maxed Racing super-sub third in the #ForeverForward running for the weekend. It’s Halfords Yuasa Racing’s triple champ Matt Neal that still heads the way in the overall #ForeverForward charts going into the Brands Hatch finale weekend.